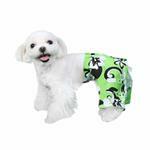 Your pup will have fun in the sun while wearing these bright and playful Pattaya Dog Swim Trunks in Green from Pooch Outfitters! 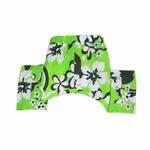 Bright green swim trunks with Hawaiian flower accents. Includes pocket and grommet details. These cotton/poly board shorts are perfect for your pooch by the pool or the ocean, or just to get that fun in the sun look! They include an elastic waistband and touch fastener closure for easy attachment and secure wear. Made of 50/50 cotton/polyester blend. They're a must-have for summer fun! Posted On 06/18/17 by Ellen M from Bonney Lake, WA Yes, Ellen M recommends this product! They fit perfect on my lil 2.5 lb Yorkie. He looks adorable!!! we are a non-profit animal rescue group. We apply for grants, and sometimes they are specific to leashes, harnesses or other pet related purchases. Our little dogs leave our group with adorable matching harnesses, leashes and collars. we love your products, and the website.